When it was feared that the Germans might invade England during the last world war, Parliament ordered that normal church bell ringing should stop. The bells would only be rung to warn of an enemy landing. 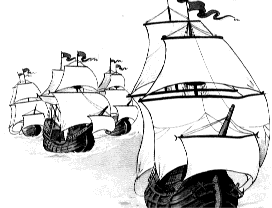 The Spanish Armada, 1588, with which Philip of Spain hoped, but failed, to invade England.